1) I hate the use of the word ‘real’ in the sense of ‘real world’ or ‘real job’. It is invariably used to trivialize the work and position of the individual who is not partaking in someone else’s definition of real. It implies one’s life occupation is a delusion without value, usually meaning monetary value. I once even had a senior administrator at my own college tell me my department ‘was the happiest la-la-land of academia’. He meant it as a compliment to my managerial skills, I think. While academics are used to hearing the phrase ‘real world’ in anti-intellectual contexts, I suspect its also a classist sentiment. One that disparages the labor of those who do work different from one’s own. The handy thing about it as a slur is that its perfectly acceptable to say to someone’s face AND its flexible enough to be used against those both above and below the speaker on the socio-economic scale. 2) I hate drafting. I’m usually a write it once and never change it kind of gal. I sweat over each damn sentence. The blog has effectively tricked me into drafting. I just had an awesomely productive writing morning for the book, largely inspired by various disparate posts written scattered over many months. No one sentence in the book draft matches the blog and yet boy it was easier to bang out those words with the posts up in front of me. Combination of two masks and a wild boar’s head. 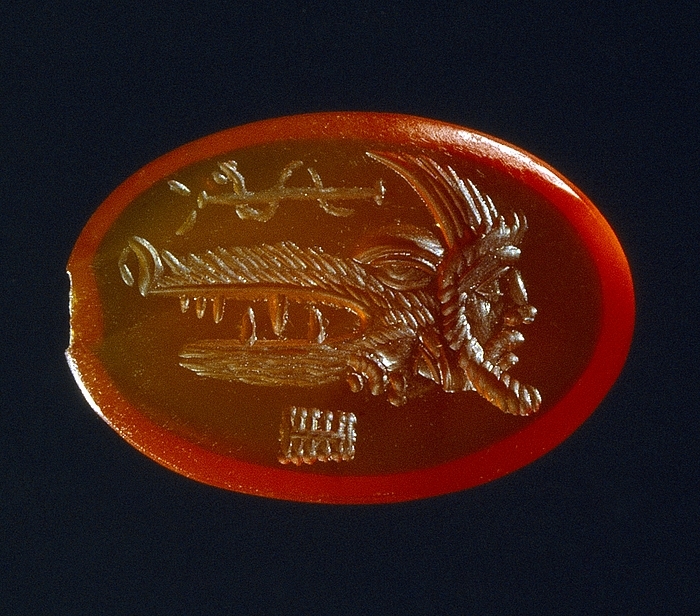 Roman ringstone, 100-300 Cornelian. 1,1 x 1,6 cm. Inventory number: I1538. Thorvaldsens Museum. Latium, Signia. Obol circa 280-275, AR 0.64 g. Head of Mercury r., wearing petasus; below neck, dolphin r. Rev. Mask composed of Silenus head l., and boar’s head r.; below, SEIC. Campana CNAI 1b (this reverse die). BMC 3 (this reverse die). Historia Numorum Italy 343 var. Let me assure you that the gem above is by no means a one off. And based on descriptions without images the Thorvaldsens Museum has a number more similar gems, Inventory numbers: I1537, I1539, I1722, I1536. The last two are of particular interest as they are glass pastes which suggests the image had resonance with members of a variety of different social classes. This particular type even made the BBC! 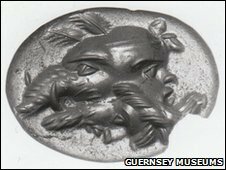 From a 30 March 2010 article ‘Guernsey, the Roman Empire’s trading post’. Image links to article. What the heck does it mean? Was it the badge of some particular noble? Or like grylloi is it a humorous, apotropaic emblem? Or a philosophic meditation on the theme of man and beast? Or all these things? or something else entirely? For follow-up later: Henig has some clever things to say about gems usually. There are two possibly related gems (CG72 and CG 354) in the Fitzwilliam that he’s written up in his 1994 catalogue. Must get those pages from ILL… Strangely none returned in BM, Met, or Boston MFA searches all of which have robust gem collections. As an aside, I find it funny that Mercury on the obverse is wearing a necklace or similar band. At first I thought at first it might be an unfortunate die break, but it shows up on a different die as well, but not all of the dies. Also what the heck does Mercury have to do with dolphins? Could it have anything to do with bizarre composite deity on the coins of Bursio who has wings and a trident (RRC 352/1)? I doubt it. But finding any representation Hermes or Mercury with any nautical attributes is tricky. Update 4/11/2014: If more canting types from Italy are sought, consider Rutter’s note at HN Italy 446, an obol of the Saunitai with a javelin head on the reverse, σαύνιον = javelin. He gives a date of c. 325.
cf. also this other Gori plate. Yesterday, I decided I couldn’t see the shape of the chapter. So I moved off the computer and started sorting. 57 coins later I’ve got a pretty good sense of the intersections, but the linear narrative isn’t there yet. In the process I found a secondary topic that is just itching for independent publication as a ‘note’ somewhere. SDA had me dictate a draft of that piece to him first thing this morning so after the chapter is done I have something substantial to come back to. It was our second dictation attempt. The first was for a book review. The idea is to get more words on paper quicker with less fretting. So far so good. Okay back to my scraps of paper. 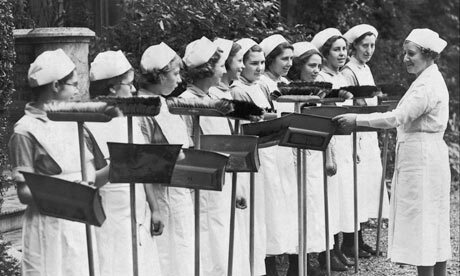 Out of the economic chaos emerged the Civilian Conservation Corps (CCC). Its goal was two-fold: conservation of our natural resources and the salvage of our young men. The CCC is recognized as the single greatest conservation program in America and it served as a catalyst to develop the very tenets of modern conservation. The work of America’s young men dramatically changed the future and today we still enjoy a legacy of natural resource treasures that dot the American landscape. 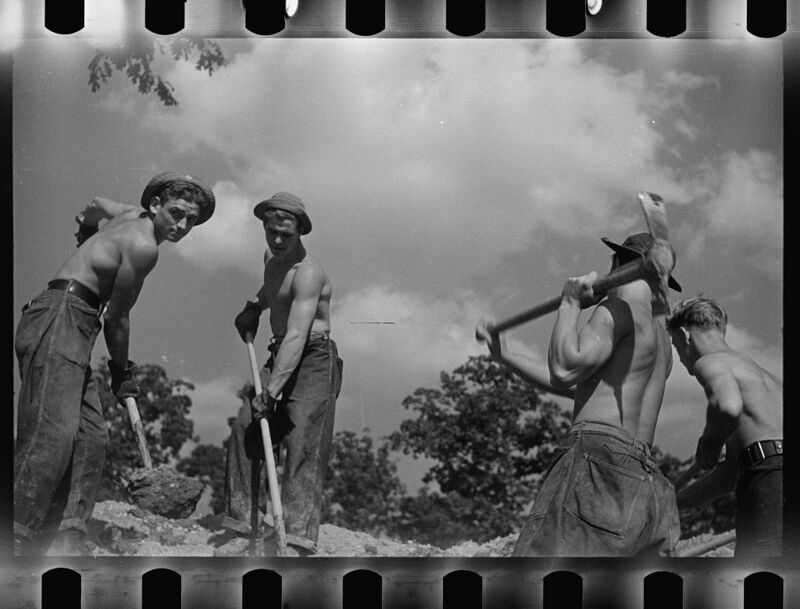 I worked on Labor Day, but not like the men of the CCC did! I am in awe of the scale and lasting legacy of the New Deal. Chapter six and accompanying apparatus is done, including an attempt at embedding html indexing codes. 8,667 words, excluding block quotations from primary sources. Just 1,667 words over my goal. SDA is reading for clarity before it goes out to the editor. An editor of the book review I finished July 15 got in touch at the end of last week. The extra length won me devilish choice. Find a way to cut half of it and keep the original commission or accept a new commission for the same piece from a newer less well known journal with open access. (The editor happens to work on both journals.) In the end I decided to keep the length and will put a link on my academia.edu site in order that it might be read at some point my someone. Book reviews are perhaps the least prestigious type of publication. More like public service than something one engages in for personal career advancement. I found I couldn’t really bring myself to care too much about the relative prestige of journal and rather would have out there the fullness of my opinion. I have 18 work days between now and when I leave for Turkey to turn the talk I gave in July into something ready for publication. That’s being realistic that I will not be working on it in Minnesota when I visit my mother (I have a whole PHD thesis to read then! ), nor am I likely to work on it the day I actually participate in the PHD viva. It also saves three days prior to our flight for packing, cleaning, banking and whatever other odds and ends are needed to close up our NYC life and relocate to Turkey for 10 months. On balance, I’m satisfied with my progress. Yes. This is also 72 out of 410 days, but the 100th post seems to take numerical precedence. What is this obsession with base-10 numbers we have?! At the beginning of this I set out some reasons why I was blogging. I’ve been asked what I get out of it by friends and colleagues: “what’s the pay off?” I’m a visual oriented person. This particular format of “picture first followed by text and more pictures and links to other tangential or directly related material” feels really natural. It’s an easy way for me to write. I find the image first and then let it flow from there. It’s just like how I prep classes or write a conference paper or invited talk. Images are organized first with a few words on PPT slides and then i slowly craft a text while building a supplemental handout with chunks of primary sources and references to secondary literature. The three files grow simultaneously. This blog mimics for the book the conference presentation writing process prior to the chapter or article publication. Here is the playful connection of ideas. The fun and endless images, en masse and in full color. The asides. The working out a way of saying something before it crystallizes on the page in front of me. The enthusiasm over the new-to-me discovery process rather than the certitude of a published thesis. 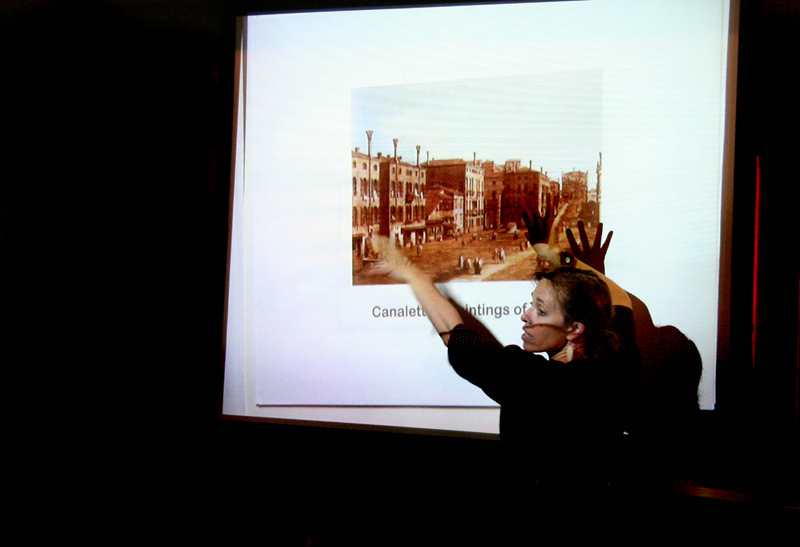 I need a loose conception of audience and performance to motivate and inform my crafting of the words. Words that explain what I’m seeing in the images OR just words that capture the same resonance as the metaphoric image I’ve selected to reflect a loosely formed idea. When I write conference papers I label the file ‘script’ not ‘draft’. I don’t want to confuse the oral form of the words with that which will be experienced on paper with footnotes and only a few select images. Why do I write this way? The internet wants to categorize me as a visual spatial learner. This seems to be a Pop Ed buzz phrase. It seems to be happy fuzzy spin on how to teach autistic and dyslexic people and any one else who is a “problem” learner in some way. But, while my dyslexia and other learning disabilities are very very real, how I do “learn” doesn’t really seem to need a label. I also like sequences and statistics and spreadsheets with complex formulas. 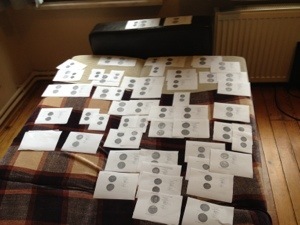 I’m a numismatist after all! And while I was a late reader (age 7 and not proficient until 9), I certainly have no aversion to reading texts, in either the literal or theoretical fashion. So is the blog worth it? Absolutely. postscript. It also, to a lesser extent, harnesses the power of social media distraction or internet procrastination. It means when I stop working the first place I turn to is in fact directly work related. I keeps me constantly on task. Or, demands, if I’n not on task, to explain myself. Thus, it is the outward manifestation of the superego and her big stick. Full rough draft of chapter six exists as of this morning. Afternoon was spent keying in long hand, editing, checking citations, and rewriting. 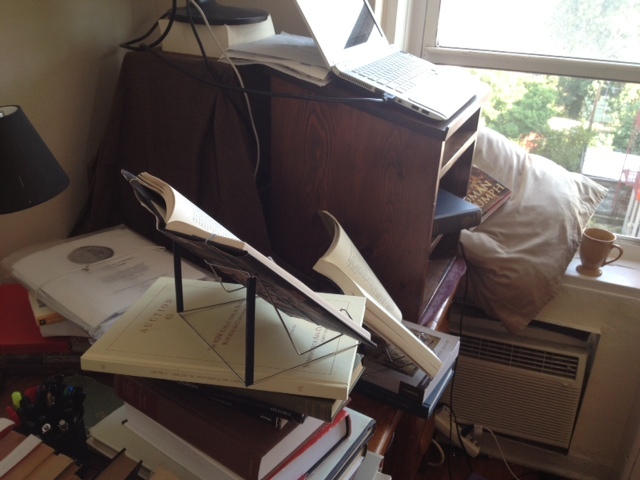 That is the “surface” of my desk this morning. I’m not sure there really is a surface under there. Is this because I’m a creative mind? Maybe. Maybe, I just have a hard time focusing on one thing. What if I need it later? What if I lose the reference? What if forget to come back to it? OH MY G-D! I’m a data HOARDER. Some people hoard bits of string. Or tins of food. Or boxes of garage sale finds. Even some people to whom I’m related… Nope, not me. All information, all the time. A veritable pack rat of details. The last couple days I’ve been trying to restrict my pdfs and browser tabs to a single one of each. To open another, I must close the last. It seems to help. Now that I think about it a few colleagues have periodically said “Wow, you have a lot of windows open.” when they stop my office at work. Maybe I should have picked up on that feedback a little sooner. * – If you’re the friend who posted the e-card above. I’m really sorry for being so horribly judgmental. And, thank you for helping me come to a useful little self realization. At the blackjack tables! No. Not really. Not even the house. Just Chapter 6. I ended doing a major restructuring which felt satisfying and then I decided it was about time that I created neat and tidy corresponding apparatus: 1) numbered block quotations and groups of block quotations for corresponding literary sources with proper references to such in the text, 2) an actual bibliography used if a proper format, rather than a jumbled list of things I’d like to include, 3) (a) a number list of figures with (b) a list of cross references to figures in other chapters so I have something to check later to make sure in the final drafts those other chapters actually contain what they’re supposed to. It is easier to revise a bad draft than agonize over a first draft. That’s there as a reminder that I’m enjoying the revision process and that I shouldn’t worry about imperfections in first drafts. Something is more than nothing. I tell that to my students all the time. I’m struggling a bit with the lack of footnotes. I think I could have them. Another book by the press in a different series but with a similar target audience used them. It was recommended by the editors as ‘inspiration’. One of my peer reviewers thought they might be better than parenthetical notation. All that said, they could get out of hand. They could start to clog the page and trigger OCD-like compulsions for completeness. Parenthetical notation feels like it will keep me in-line, writing for a-scholarly-but-still-introductory audience. For now. I cheated yesterday. It was totally a work day and I didn’t give you a coin. Do I feel guilty? A little. Do you feel lied to and like our strong foundation of trust is broken? Are you disappointed in me? I promise I will make it up to you. I woke up in the middle of the night linking about this coin. Perhaps that was my conscience eating at me. The jug and lituus and wreath reverse kept throbbing behind my eyelids. The IMPER pulsed. They want to make sure I don’t forget about them apparently. On the other hand, on waking I was treated to a little refrain of a Turkish conversation that featured in my audio lesson yesterday? “Amerikalı mısın? Evet, Amerikalıyım.” Over and over. I apparently I’ve got that bit down. Now, if I could just get better about saying and understanding the verb to KNOW, I’d feel like progress was being made. Okay. On with it properly now.